The cornerstone of St. Mary's liberal arts and Marianist education. With more than 20 disciplines to choose from, this is the largest school on campus. 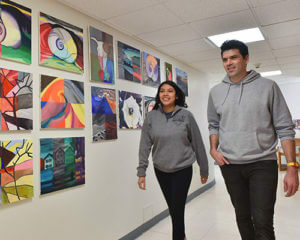 Students at St. Mary’s University interested in pursuing a degree centered around art may earn a Bachelor of Arts in Art Education or minor in Art. The bachelor’s degree in Art Education with All-Level Teacher Certification (Early Childhood-Grade 12) is designed for the student pursuing her or his interest in the visual arts and who wants to share that interest through teaching. Students will develop studio skills through courses providing experiences in traditional materials and methods as well as electronic digital image making. Through the study of art history, students will acquire knowledge of where humankind has been and where it is now as makers and creators in the world. Through the study of art education and in concert with the St. Mary’s University Education Department, the student will acquire skills needed to work in today’s art classroom with knowledge and passion. 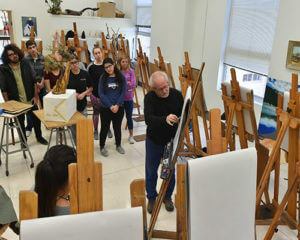 Students at St. Mary’s take courses in art for many reasons, including to fulfill the fine arts requirements of the Core Curriculum, to obtain an art minor, to obtain a Texas Education Agency-certified second teaching field in elementary or secondary education, or simply as an elective. 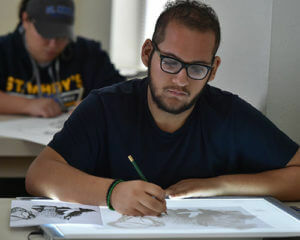 Students who take art courses as electives often choose Drawing, Design Fundamentals, 3-D Design, Painting, Printmaking, Sculpture, or Art Fundamentals. Because there are no prerequisites, any art course may be taken as an elective. Students have the opportunity to show their work in the annual invitational student exhibition held in the Louis J. Blume Library. Students also can participate in the annual San Antonio Art League and Museum College Exhibition and attend the First Friday Art Walks, as well as other citywide events.